Creatures you control get +1/+1. Creatures your opponents control get-1/-1. 2WB: Exile target card from an opponent’s graveyard. 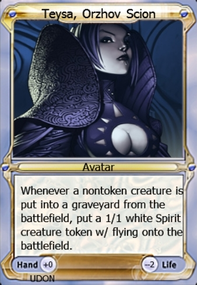 If it was a creature card, you create a 1/1 white and black Spirit creature token with flying. -Arcanity- The reason I mention Ajani, Adversary of Tyrants is because his first 2 abilities go very will your deck. +1 gives counters power up small creatures like the tokens from Seraph of the Scales and his -2 brings a creature with mana cost 2 or less back to battlefield which your deck is mostly consistent of. His ultimate is pretty good for life gain and I’ve found it works very good with Ethereal Absolution . Also point taken on the angel, it is a bit slow. frosthammer_eden You are absolutely right, correction made, tyvm. lorenzo712 I've got Kaya's Wrath in the sideboard, and I am considering mainboarding it in lieu of Unbreakable Formation . I've definitely run into more situations where wiping the board is the more useful thing to do. While Debtors' Knell would be exceptionally useful, I was trying to play this deck with some other expensive enchantments like Open the Graves and Ethereal Absolution and found it just wasn't working. 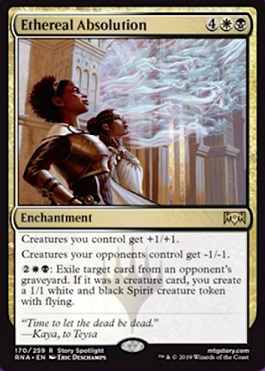 With the way Pitiless Pontiff winds up carrying things while ramping up, I always want to leave 1 mana open to keep her a threat during my opponent's turn, and this considerably slows things down. Essentially playing one turn behind curve, starting turn 3. Spending 5 or more mana on an enchantment that doesn't immediately effect the board state just isn't worth it. I'm making an exception for 2x Divine Visitation s but I don't want anything else at this point that costs more than 4. Thanks for the suggestions! A quick rundown of the first changes I'd try to implement. You'll want some way to deal with artifacts and enchantments, possibly Seal of Cleansing in the sideboard. You don't have valuable many-for-ones ( Merciless Eviction , eg); if you want more play versus aggro decks you might add some. Languish , Dusk / Dawn , things like that. 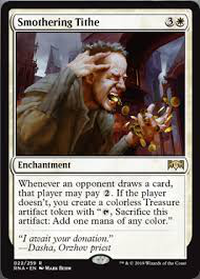 Also you don't have exile-versions of removal, but white and black are good for it, if you wanted to give up some of the "sacrifice for insane value" plan. Utter End and its variants. I like the deck idea, I got an afterlife deck that could use some tuning as well ha. I think the biggest issue I found with afterlife was Card draw, It's definitely manageable without more draws but not so good when out of cards in your hand. If you think more card draw could possibly help out with this deck consider Mentor of the Meek ? or even Midnight Reaper ? I like Kaya, Orzhov Usurper and would soon like to find a deck that builds around exile with her. Have you found much use with her by any chance? 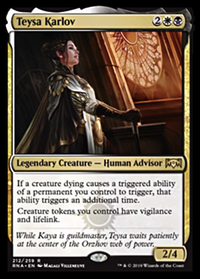 I usually find her not to be best in an afterlife deck but rather a pure RNA Orzhov deck with other cards like consecrate/consume. Seraph of the Scales is perfect as a 4 drop for any orzhov deck. Last bit of thought because I type alot is, I find afterlife to work best when you can get a bunch of them out but the ability to enhance them further while also being able to re-trigger them similar to what you have with find/finality or even Revival / Revenge . Afterlife is a great mechanic and if you can get lots of spirits out its well worth it. Teysa Karlov alongside them especially. Maybe cut some of the more exile cards, treasure map is good but not sure if its necessary for the afterlife theme. If anything I would have a bit more creatures with afterlife or for card draw as I mentioned before with Mentor of the Meek . Thanks for reading if you do, hope some of it helps in a way or two.